Just when you thought the Phillies would leave the Winter Meetings empty handed, Ruben Amaro grabbed a new centerfielder named Ben Reeves and said goodbye to Vance Worley and Trevor May. This was a nice move for the Phillies. Ruben Amaro used areas of strength to fix an area of weakness. The Phillies desperately needed a centerfielder. They weren't about to leave Mayberry in center and were not willing to overpay for Bourn or take a chance on Hamilton, so they cashed in a couple chips in a trade. Ben Reeves is a great addition to this Phillies team. First and foremost, he is from all accounts an excellent centerfielder. Entering a season with the possibility of Ruf and Brown in right and left, the Phillies needed someone who could cover ground and Reeves can do just that. The only downside defensively is that he has a weak arm, maybe even worse than Juan Pierre according to Jim Salisbury. Offensively, Revere is your prototypical leadoff hitter who can hit for average, steal bags, and score runs. The 24-year-old is a career .278 hitter with a .319 on-base percentage, a .323 slugging percentage and a .642 OPS in 989 career at-bats. Last season he hit .294 in 553 plate appearances with the Twins, stole 40 base in 49 attempts, and scored 70 runs. The one thing Revere does not have is power: he hit exactly zero home runs last season and had five home runs in 1,755 minor-league plate appearances. Overall, Revere solves the Phillies centerfield problem and will be a good player to have at the top of the Phillies lineup. Finally, and maybe most importantly, he is young and cheap. But Reeves did not come free. The Phillies traded away a solid number 3 and a good pitching prospect. Worley was fun to watch and could be a solid pitcher in this league, but he wasn’t Ferguson Jenkins. With three aces at the top of the rotation, the Phillies could afford to part ways with the Vanimal. The Phils got a little weaker in their starting rotation, but became a lot stronger in centerfield. If the deal was Reeves for Worley straight up, this would have been a no-brainer. But the Phillies also needed to give away one of their top pitching prospects. Trevor May, a 23-year-old righthander, was listed as their number 2 prospect and was the 69th ranked prospect in the minor leagues by Baseball America before last season. May ran into some difficulties last season with a 10-13 record and a 4.87 ERA at double-A Reading, but he still has plenty of upside potential. But Ruben Amaro felt he had some flexibility with minor league starters. "We were dealing from what we considered a position of strength." Amaro said. "We've added some talent as far as starting pitching is concerned toward the top with Ethan Martin, Jonathan Pettibone, Adam Morgan and some others. We felt comfortable moving them. The price of doing business right now to acquire players and free agents." Hamels, Lee, and Halladay are a pretty good 1-2-3 punch and they gave Amaro the flexibility to work this deal. They lost a good, young, starter in Vance Worley and a talented minor leaguer in Trevor May, but they received a good, young, centerfielder in return. With the Michael Young deal hovering, this might be the first of many offseason moves. Acquiring Ben Revere was a nice start. Is Michael Young trade to Phillies a good deal? The Michael Young trade was terrible for the Phillies. The Michael Young deal was a great move. The Michael Young move was pretty good. The Michael young trade was a fairly bad deal. Pick from any of the above headlines and that is what you might read in the next few days. If Michael Young waives his no-trade clause and accepts a trade from the Rangers to the Phillies, we could be looking at a horrible move, a fantastic move, or anything in between. Whether or not Michael Young is a positive acquisition depends entirely on what the Phillies surrender in return. De Fratus, Lindblom, Schwimer, and Rosenberg are all names that have been floated out there. Before examining each trade possibility, let’s take a look at what the Phils would be getting in Michael Young. Michael Young is a 7-time all-star with a career .301 average, .347 OBP, .444 SLG, and .791 OPS. He averages 16 HR, 87 RBI, and 96 runs scored per 162 game season. Michael Young has been a premier player in this league for many years, and was well worth the 5 year/$80 million deal he signed in 2009. At age 36 (his birthday was on Oct 19), Young is no longer a $16 million player. His numbers feel off last year and he finished with a .277 average, .312 OBP, .370 SLG, .682 OPS, 8 HR, 67 RBI, and 79 runs scored. He has now become a borderline liability defensively and played primarily DH over the last two years. He also was apparently well liked in Texas and a good clubhouse leader. Rumors are that Texas would be willing to pay all but $5.5 million of his salary, and at that rate Young is certainly a better option than a platoon of Galvis and Frandsen. Again, it still hinges on what the Rangers get in return. Trading Justin De Fratus for Young falls under the category of what the bleep were you thinking?! The Phillies need an upgrade at third base, but not at the expense of the bullpen or quality future prospects. The Phillies had a shaky bullpen last season to put it mildly and can’t afford the same outcome in 2013. De Fratus is a young, cheap, controllable piece who could really help ease the burden in the Phillies bullpen. Tossing De Fratus away for an aging player on the downside of his career to marginally improve third base would be disastrous. Same story as before, but this time replace the name DeFratus with Michael Schwimer or B.J. Rosenberg. It would be like replacing a fairly good actor like Will Smith with Nicholas Cage. Schwimer and Rosenberg are marginal major leaguers at best. If all it takes to upgrade third base is either one of those two throw-ins, you take it in a heartbeat. Celebrate if that deal goes down. Young for Lindblom. Hmmm. Lindblom is still young, pretty cheap, pitched pretty well for the Dodgers, and has more experience than half of the Phillies current bullpen crew. But he allowed 13 home runs in 71 innings and with the Phillies he had a 4.63 ERA, 6.6 walks/game, and a WHIP of over 1.5. I probably make the move considering how notoriously unreliable relievers tend to be and it might be worth the risk to upgrade a position in serious need. No updates yet on whether or not Michael Young will accept the trade, so I guess we will have to wait to decide if this was the good, the bad, or the ugly. I guess Michael Young's wife Cristina, or, I mean, Michael Young agreed to waive his no-trade clause and accept a move from the Texas Rangers to the Phillies. As I mentioned in the last article discussing the possible acquisition of Michael Young, this is Ruben Amaro's second positive trade in a row (I've been waiting so long to say that). This deal improves the Philadelphia Phillies, although how much remains to be seen. Young provides stability at third base which otherwise would have been missing. Kevin Frandsen had a great season for the Phils in 2012, but he is a far bigger uncertainty than Michael Young. Freddy Galvis dwarfs both Frandsen and Young defensively, but his bat is much weaker. Let's face it, Young is a significantly better option than Frandsen/Galvis. Michael Young is a 7-time all-star with a career .301 average, .347 OBP, .444 SLG, and .791 OPS. He averaged 16 HR, 87 RBI, and 96 runs scored per 162 game season. The 36-year-old's numbers declined last year and he finished with a .277 average, .312 OBP, .370 SLG, .682 OPS, 8 HR, 67 RBI, and 79 runs scored. But Young is just one year removed from hitting .338, leading the American League with 213 hits, and driving in 106 runs while scoring 88. While it is possible Young has already began a drastic decline, it is nearly as likely he will bounce back to his past form. He is a professional hitter, plain and simple. He knows how to get on base and dude knows how to win. Young has become somewhat of a liability defensively, which is why he played primarily DH over the last two years. But Michael Young was extremely well liked in Texas and a good clubhouse leader. The fact that the Rangers will eat roughly 10 of the $16 million guaranteed to Young in 2013 does sound a bit alarming, but that is mainly because the infield was too crowded with Adrian Beltre, Ian Kinsler, and highly regarded rookie Jurickson Profar. The memory of Freddy Garcia is never far from my thoughts, but I don't think that is the case here. Lindblom is still young, pretty cheap, pitched pretty well for the Dodgers, and has more experience than half of the Phillies current bullpen crew. But he allowed 13 home runs in 71 innings and with the Phillies he had a 4.63 ERA, 6.6 walks/game, and a WHIP of over 1.5. Lindblom would have been a fairly central piece to the Phillies bullpen, but the Phils have plenty of other young arms waiting and you can always take your chances on the Chad Durbin's of the world if need-be. That said, the Phillies must bring in some bullpen help to avoid last year's debacle. And Michael Young just looks better on the lineup card, doesn't it? So completes a fun week of wheeling and dealing for the Phillies. Why is there so much love for the WAR (Wins Above Replacement) stat? The Inquirer just mentioned that Michael Young’s WAR was “among the worst seasons in modern baseball history” and “there are only three worse seasons (minimum 600 plate appearances) than Young's minus 2.4 WAR since 1947.” Really? I guess that means he had the third worst season in Major League history. Before we get into how ridiculously ludicrous that is, here’s a brief refresher on WAR. Baseballreference.com defines WAR as “A single number that presents the number of wins the player added to the team above what a replacement player (think AAA or AAAA) would add.” Their scale for a single season is “8+ MVP quality, 2+ Starter, 0-2 Reserve, <0 Replacement Level." As a point of reference, the Top WAR in the AL was Mike Trout with 10.0 and the worst was Casey Kotchman with -1.5. It's important to note that the pitching WAR is completely different from the WAR for position players. The WAR for position players measures hitting categories plus fielding, but the pitching WAR rates players based solely on pitching categories. I find it humorous that the "all encompassing" WAR for pitchers completely ignores players like Cliff Lee who can handle the bat and guys like Blanton who might as well keep the bat on their shoulders. Some of these sabermetric stats are very useful, but this is one I will largely ignore. WAR is a subjective stat in which barely a sole knows how it was derived. WAR is also highly cryptic considering there is no uniform formula, and all of the big stat sites calculate it differently. I would imagine most of us could come up with our own scale that would work just as well. 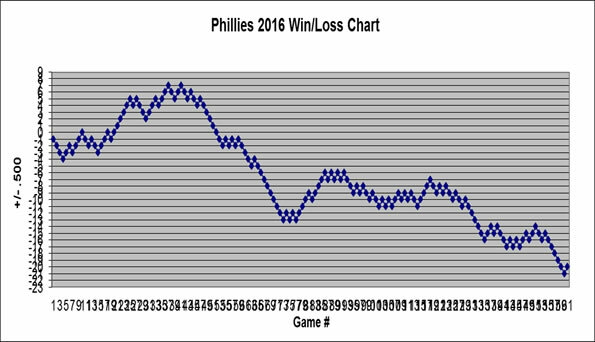 Let’s use that scale on the Phillies. Last season, Michael Young would have ranked better than only one regular player (Ty Wigginton). He ranked worse than Mike Fontenot, Freddy Galvis, John Mayberry, Placido Polanco, Brian Schneider, Michael Martinez, Nate Schierholtz, and Domonic Brown. Young did not have a great season, but he was certainly better than most of the players I just mentioned. Here is a list of Phillies regulars in relation to Baseball Reference’s scale. The players fit fairly well into the categories, but it is in no way perfect and the rankings are pretty sketchy. WAR makes a lot of sense in theory in that it basically provides the overall value of a player, taking into account everything he does. But in reality it serves virtually no purpose whatsoever. How would you rate a player who hit 22 points above the league average in batting average, 7 points below the average in OBP, 10 below in home runs, 7 below in RBIs, and a poor fielder? Under my own sophisticated ranking system, I rate his 2012 season as OK, not the third worst ever. Any statistic which ranks Michael Martinez above anybody seems a little shady if you ask me. As I suggested earlier in the offseason, the Phillies found the best bullpen option on the market and signed Mike Adams. The deal is reportedly for 2 years and $12 million plus a vesting third year option. Especially after losing Josh Lindblom in the Michael Young trade, the Phillies desperately need to fill the eighth inning void and they accomplished that with landing Mike Adams. The 34-year-old righty has a career 2.28 ERA in eight seasons and his 1.98 ERA over the past five seasons is third lowest of all relievers with at least 153 innings pitched. Last season was a down year for Adams and his worst full season since his rookie season in 2004. He went 5-3 with a 3.27 ERA in 61 appearances last season with the Rangers. Health is also a question mark. Adams had surgery in October for thoracic outlet syndrome, which causes pain and numbness in the arm. He should be ready by Spring Training, but we will have to wait and see if that actually happens. Adams is yet another great move by Ruben Amaro during the offseason. It has been reported by multiple sources that the Phillies have signed starter John Lannan to a one year contract. The deal is reportedly for 1 year with $2.5 million guaranteed and performance bonuses that could increase his salary to $5 million total. Lannan is a 28-year-old lefty with a career 42-52 record and a 4.01 ERA in 134 starts. Lannan only started 6 games last season and went 4-1 with a 4.13 ERA. In his last full season in 2011 he went 10-13 with a 3.70 ERA in 34 starts. The Phillies were looking for a low risk, high reward player, which is what they appear to have obtained with Lannan. Take a look around Citizens Bank Park and plenty of things will grab your attention. The Phillie Phanatic, Ashburn Alley, and Harry the K's, just to name a few. If you went to the ballpark last season, you likely noticed an additional feature in the stands. His name is Gregg Murphy. Gregg Murphy officially joined the Phillies family last season when he became the Phillies field reporter, providing reports from the field, the dugout, the stands, and pretty much anywhere else in the park. If you ran into Murph on your way to your seat last season, you probably saw a familiar face considering he has lived his entire life in the Philadelphia area and has been with the Comcast Networks for 14 years. Murphy was born in Meadowbrook, PA, raised in Mt. Laurel, NJ, and now makes his home in Mullica Hill, NJ. He attended Holy Cross High School in Delran, NJ, where he played CF and SS for 2 years before a broken hand ended his baseball career. He graduated from St. Joseph’s University with a degree in English. His broadcasting career began at QVC in 1993 as the host of a sports memorabilia show. In 1995, he hosted A Piece of the Game, a weekly sports memorabilia show that aired on Sports Channel. His first "real" sports job came as a sports reporter and weekend anchor at WFMZ-TV in Allentown before becoming a host and reporter for The Inquirer High School Sports Show on FOX. In 1999 and for the next ten years he worked at CN8 as a host of Out of Bounds. Prior to his current role, he was a reporter and anchor at Comcast Sportsnet from 2009-2011. Now that his first full season is over and he has a much deserved winter vacation, I had the chance to catch up with Murph to learn a little more about him, see how his first season treated him, and gather a few of his thoughts on the Phils. Growing up as a Phillies fan, it must be a dream come true for you to become the Phillies field reporter. What has the experience been like? It absolutely has been a dream job. I was a huge Phils fan and watched Harry, Whitey, Andy Musser, and all those guys growing up. It is fun to be a part of it – absolutely amazing. It happened quick. I got a call from my boss on Feb 15th. I was told they were looking for someone to join the broadcast team and they offered me the position. It was the opportunity of lifetime, but I did not have much time to think about it because I only had two weeks before going to Clearwater for five weeks. But it felt like 2 days! This is obviously a major lifestyle change for you and your family. How do your wife and kids feel about your new role? It was the one thing that gave me pause. When I came home after receiving the offer, I sat with my wife and she cried. She was upset because she knew how much travel was involved, but she slowly got past that. My daughter was in 8th grade at the time and my sons were 11 and 8. They were all Phillies fans. The hardest part is knowing that I can’t go to all of their sports games and events. It was hard, but at CSN I would be working weekends, holidays, and late nights. They all fell into a routine and now I’m off for five months. During the season, the kids went to all of the games in Baltimore, my wife went to Miami, and we had about ten home games for the kids. Everybody is coming to Clearwater this year. It won’t be as difficult this time, but it was the toughest part. What is life like as Phillies sideline reporter? What is a typical day for Gregg Murphy during the season? It’s kind of crazy, but a good crazy. On a typical day (for a 7 p.m. home game) I come to the park by 2:00 or 2:30 and I’m in the clubhouse at three. From 5 to 6:30 I’m available for reports on Daily News Live, Sportsnite, and the pregame show. I meet with our producer, Jeff Halikman, at six to discuss possible topics for the game. At 7:00 I start roamin and map out a spot. After the game, I just wait out the traffic and head home. I generally have six different ideas and will take maybe three or four of them. A lot of it depends on the game. If we are getting blown out I won’t do a fun bit. I’m a fan, too, and I don’t even want to watch that. If we are winning I will try to do the fun segments. I also try to bring some baseball to the game, as well. Now that the season is over, I do a Phillies show on Comcast Sportsnet each Tuesday following Sportsnite. What is the best part about being Phillies sideline reporter? The best opportunity, especially at home, is the interaction with the fans. I’m talking to folks all the time and people are always coming up to me to talk about the Phillies. The fans are terrific and they’ve really accepted my role. And Phillies fans travel really well. No matter what park we go to, Phillies fans are all over the place. Are there any moments that stand out for you from last season? Paula Abdul perhaps? Paula Abdul is definitely one of them. The reaction to that one has been great. There was also a game in Arizona when a woman puked on me. I was walking through the stands looking for a spot and I bumped into a woman. I said, "Hey I’m sorry," and then she puked all over me. It went everywhere, down my legs, and into my shoes. It was really disgusting. During another game, I was doing a spot out in front of Harry the K’s and there was a guy doing a crazy dance and acting silly behind me. Tom McCarthy mentioned while we were on air, "There is crazy guy behind you, go get a shot of him." Later on, just for fun, I got behind the guy and started imitating and acting crazy like him. That ended up being the final spot on Comcast Sportsnet’s 15th anniversary show. What is it like working with Sarge, T-Mac, Wheels, and the rest of the crew? Tell us something we might not know about the guys. Anytime you join a new group you are a little hesitant. I knew Tom and Wheels, but I did not know Sarge outside of saying hello in passing. From day one it could not have been better. I talked to Tom a lot and he gave some great advice. The guys made it easy for me and we eventually hit a pretty good stride. I really enjoyed it. It was so great. The one thing people may not know about Chris is that he is just the most wonderful guy. He is a terrific person and he is truly concerned about everyone. Wheels knows the game as much as anybody in all of baseball, and that includes players who have actually played the game. Another thing people probably don’t know is that Tom is a big teenager. He is always pulling pranks. He puts sugar packets in Wheels' briefcase, hides his wallet, and moves his car keys. He hides behind a door just about every day and scares the crap out of Sarge. Sarge lets out a huge scream every time. Tom is also one of the best broadcasters in the game. He is at the absolute top of his profession. It also helps that we actually like each other, and that includes Scott Franzke and LA, too. I think people genuinely feel that we love the game and enjoy being around each other. The biggest compliment is when people say, "Hey, you look like you are having fun." If you don’t have that, you probably should not be doing this. In your current role you get to spend a lot of time with the players and coaches. Were there any guys who surprised you when you got to know them? Juan Pierre. He is an absolute class act and he will be sorely missed. He’s the hardest worker, the first one in and the last guy out. He is practicing bunting every day. One of the nicest guys you will meet. He’s a quiet guy, but he will talk to you for 45 minutes about baseball. He was a pleasant surprise. Ryan Howard is the biggest cheerleader. He is a fun guy to be around, always smiling and joking. He is the team cheerleader and the guy who is getting the team going. He's the guy saying, "we’ll get ‘em next inning" and “let’s get going,” that kind of stuff. When he’s not around in the dugout it is awful quiet. The coaches are great, every single one. It was sad to see those three coaches let go. The hours they put in is mind boggling. How/what/when do you eat on game day? I’m a night person - definitely not a morning person. On the road, when I’m staying in a hotel by myself, I leave at about 12 in the afternoon and go look for food. Around 6:30 I go to the press dining room. After the game I have been known to grab a burger or two. I generally head off to bed around one or two o’clock. Sometimes if I’m starving I will grab food around the 4th inning. Citizens Bank Park has some great food. Miami has good Cuban food and I love it. The Phillies pulled off a trade for Ben Revere. What are your thoughts on the move? The Phillies gave up some talent for Revere. I like Vance Worley as a person and as a competitor, but as Ruben said, "You need to give up something to get something." Reeves is a guy who could be a Michael Bourn skill wise. The Phillies need a centerfielder who can get the ball. He’s a prototypical leadoff guy. I’m not sure of his work ethic yet, but maybe. I also think Ruben is not done. What do you think of the possibility (it wasn't official at the time of the interview) of adding Michael Young? I hope it happens. Michael Young plays at a high level. It can only help to add a guy that understands how to win. Many thanks to Gregg Murphy for taking the time out to chat. Be sure to catch Murph on Tuesdays at 6:30 on Comcast Sportsnet and of course throughout the season during every Phillies game. You can also hit up Murph on Twitter at @GmurphCSN. How does Phillies 2013 lineup compare to 2012? We are three days away from Christmas and the Phillies offensive shopping spree is just about finished. Now that the Phillies filled their major holes in centerfield with Ben Revere and at third base with Michael Young, the only piece left is a corner outfielder. But with Cody Ross reportedly signing with the D-Backs, the only legit name left is Nick Swisher, and he might be too expensive for the Phils. So, what you see might very well be what you get. If the Phillies were to stick with the roster we see today, how does this Phillies lineup compare to last season? One simple way to compare is to put the lineups side by side and give it the old sniff test. On the left is a “typical” lineup from the first half of the season and on the right is the likely starting lineup for the first half of 2013 (once Ruiz returns from his 25-game suspension, of course). The 2012 lineup was the jumbled mess we feared it would be: a lineup hoping to tread water until their big stars returned. Fans were screaming for Josh Hamilton over the offseason, but the 2013 lineup Ruben Amaro has assembled is for the most part solid and balanced. Charlie Manuel is likely to shuffle the lineup quite a bit, but the names will remain essentially in tact. It is a lineup that offers speed with Revere and Rollins, decent on-base percentage and production with Utley, Young, and Ruiz, and power with Ryan Howard. Oh, if it were only that simple. The Phillies have about as many question marks as there are zeros in Howard's salary. Can Utley stay on the field? What will we get out of Howard? Is Ruiz any good without PED's? Can Ruf make the jump to the big leagues? Do Mayberry and Brown even belong in the majors? Or, we could flip the coin over. What if Howard and Utley are close to their old form? What if Revere develops into a Jose Reyes? What if the 2011 Michael Young emerges? What if Ruf is the real deal? What if Brown figures it out? We have over three months to answer those questions. But for now, let's try to see how the lineups compare if everything stays pretty much the same in 2013. I kept things pretty simple with the 2012 offense and simply went to baseballreference.com and took the offensive totals at each position. For the 2013 offense, I basically plugged in the 2012 stats from the likely starters with a couple exceptions. First, I left out Darin Ruf completely, because there is no good way to predict what his stats will be. Second, I took Ryan Howard's 2011 stats because it seemed pretty clear that his injury affected him last season. Third, I took the average of the last two seasons for Michael Young assuming he is not as good as in 2011 and not as bad as in 2012. Next, I eliminated Jimmy Rollins since he was the one player who played a full season in 2012. I also prorated both groups based on 650 plate appearances to keep things equal. The first chart shows the stats broken down to a per player average. For this chart, I multiplied the above totals times 8 to give you an idea of what they would look like in a full lineup (excluding the pitcher). What you see is that the numbers are close. Really close. They are so similar that five of the totals are equally the freakin same. I even had to triple check to make sure I didn't mess up the numbers. The stats are similar, but the 2013 Phillies are better in every single category. The Phillies obviously remained about the same as far as power is concerned, but the 2013 team improved by 8 points in batting average and 21 points in OBP, while striking out 10 fewer times per player and walking 9 more times. It may not sound like a whole heck of a lot, but considering they dumped $26.15 million from Pence, Victorino, and Polanco, and replaced two of those three positions for less than $8 million is pretty impressive. The Phillies ranked 8th in runs scored last year, meaning the Phillies should rank similarly in 2013. It would have been nice to add a bat like Hamilton's, but given the free agent market, I think the Phillies made out alright.